West Hollywood’s celebration of National Poetry Month comes to a close with the city’s release today of a video called “I Sing the Body West Hollywood,” which animates a citywide collaborative poem of the same name crafted from lines contributed by more than 100 participants. The poem was constructed by Kim Dower, the city’s poet laureate, and presented during National Poetry month last year. Dower’s poem was the inspiration for a public art project called “I See You WeHo” by West Hollywood artist Miguel Andrisani, also known as Migs, which was installed last month as a set of three-story-tall triptych banners at the West Hollywood City Hall Community Plaza, located at 8300 Santa Monica Blvd. at Sweetzer. The artwork, which is a direct reference to scenes within Dower’s poem, overflows with the vivid landscape of West Hollywood’s iconic places brought to life with a cast of Technicolor-hued characters. The artwork brings the poem to life, through a digital rendering, traversing from day into night and from the streetscape to the rooftops of the city. The installation was organized by the City of West Hollywood’s Arts Division as part of its Art On The Outside program, which installs temporary works in parks and public places throughout the City. The video for “I Sing the Body West Hollywood” was produced by the city’s Communications Department, which combined the ingredients of Dower’s poem, read aloud by the poet herself, with animated imagery from Andrisani’s renderings, mixed with an electronic dance music soundtrack curated by Derek Monteiro, Audiomoe, and Aaron Colbert. The video was produced in collaboration with Zoo Crew Productions. Dower is West Hollywood’s second city poet laureate (following Steven Reigns). Her tenure began in October 2016, and continues through October 2018. 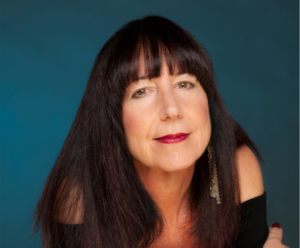 A West Hollywood resident for more than 30 years, she was born and raised in New York City and received a BFA in Creative Writing from Emerson College, where she also taught. Her first collection of poetry, “Air Kissing on Mars” (Red Hen Press, 2010) was described by the Los Angeles Times as, “sensual and evocative . . . seamlessly combining humor and heartache.” The Pushcart-nominated “Slice of Moon” (Red Hen Press 2013), her second collection, was called, “unexpected and sublime,” by “O” magazine. Her third collection, “Last Train to the Missing Planet” (Red Hen Press, 2016) has been praised by Garrison Keillor, who has featured her work multiple times on “The Writer’s Almanac.” Dower’s work has also appeared in Ted Kooser’s “American Life in Poetry,” Barrow Street, Eclipse, Los Angeles Review, Ploughshares, and Rattle. Her poems are included in anthologies including, “Wide Awake: Poets of Los Angeles and Beyond,” published by The Pacific Coast Poetry Series (Beyond Baroque Books) and “Coiled Serpent: Poets Arising from the Cultural Quakes & Shifts in Los Angeles” (Tia Chucha Press). Dower teaches workshops in the B.A. Program of Antioch University, Los Angeles. It’s amazing. You are amazing. We are amazing.